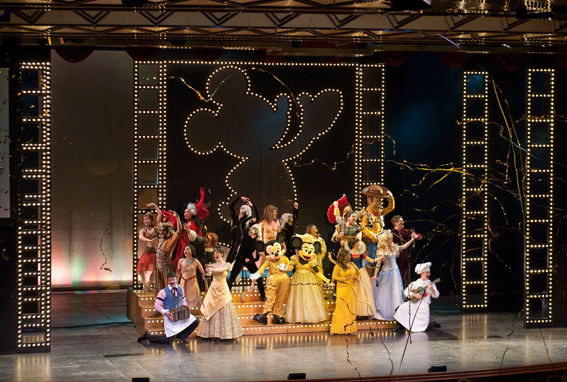 The Golden Mickey's was a major highlight of our second day aboard the Disney Wonder. 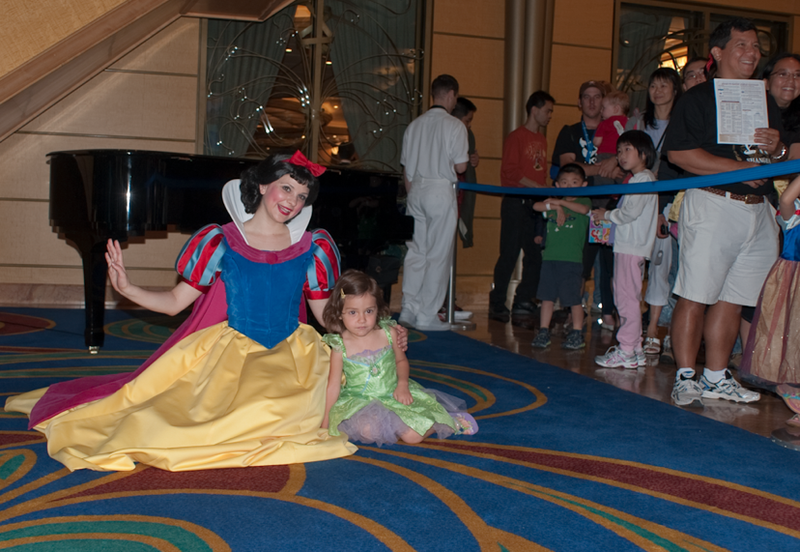 Broadway quality revues with Disney characters makes this cruise uniquely suited for families like ours. You would think my wife and I are cruise ship experts. We love to travel and live in Miami, cruise ship capital of the world. We’ve been to nearly every state in the nation, trekked thru chunks of Europe and seen most of Latin America. My wife and I have even been to Rwanda and the Congo in hard to reach central Africa. Despite our extensive travel history, we don’t have anything to show for cruise ships. Our Disney Wonder voyage to Alaska is my wife’s first cruise and only my second. On this second day of our great journey to Alaska, a so-called “sea day” because it’s dedicated to traveling to our main destinations, my wife and I spent the day discovering everything we could about the Disney Wonder. 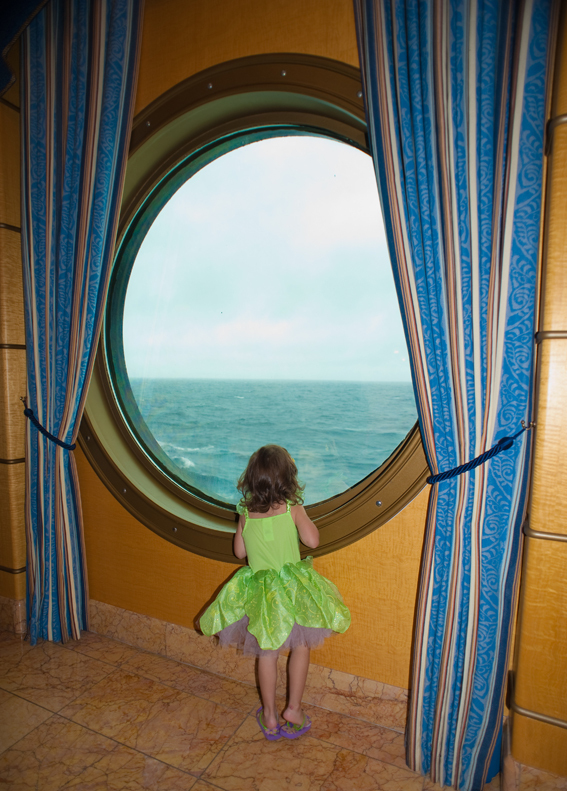 It’s still early into this ocean voyage but already we feel this cruise is going to be a very special one. 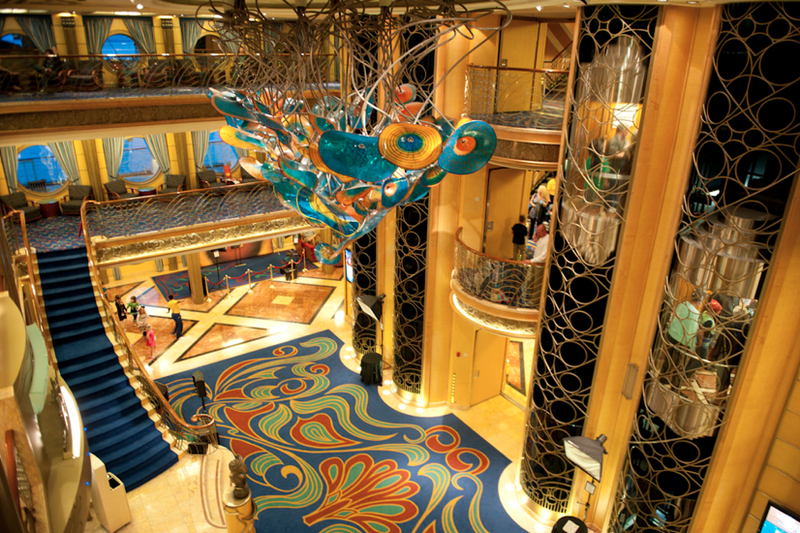 The beauty of the ship's main atrium speaks for itself. It's also where we have most of our photos taken with the Disney characters. The most captivating part of this cruise is obviously Alaska. Just saying the word A-L-A-S-K-A stirs National Geographic thoughts in us of rugged, powder-white mountains, jumping salmon and wily grizzly bears. 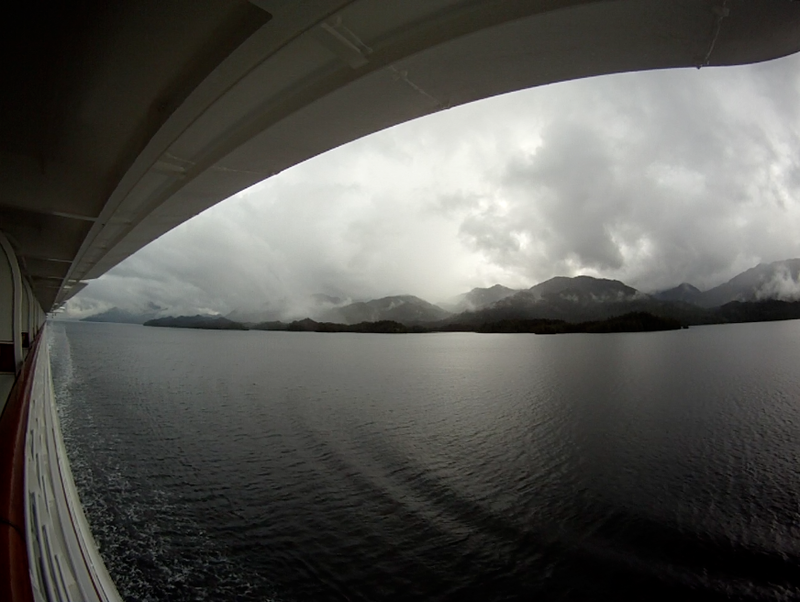 We haven’t seen any of these things yet but as if to preview what is to come, our cabin’s balcony view by itself looks like a slow moving gallery of mountains, pine forests and even occasional glimpses of humpback whales. The chillier it gets outside our cabin heading north the closer we know we are to the most magical things we’ve ever seen in nature. An extreme wide angle view from our cabin's balcony aboard the Disney Wonder. The other exciting part of this cruise is that we’re traveling on Disney Cruise Lines. Disney cruises are especially suited made for families with Disney characters, quality entertainment, a great resort-style approach to hospitality, fine dining and extreme attention to detail. You know you can’t go wrong with a cruise when Condé Nast Traveler recently named Disney the No. 1 cruise line in the megaship category and then even awarded our own ship with the top prize for best crew and staff. The Disney Wonder itself is a modern marvel at 964 feet in length with 11 public decks and accommodations for up to 2,400 passengers and 950 crew members. Of course, cruising wouldn’t be complete without great dining and in that department the Wonder doesn’t disappoint either. Our ship features five restaurants: Animators Palate (a restaurant based on the drawings of Disney characters), Parrot Cay (A Caribbean-style restaurant), Tritons (based on The Little Mermaid), Beach Blanket (for quick casual food) and Palo (an adult’s fine dining restaurant). With the exception of Palo, we will be eating at all of the restaurants for breakfast, lunch or dinner. (Tomorrow will be a special treat because we’re scheduled for the highly anticipated character breakfast featuring the Disney characters). 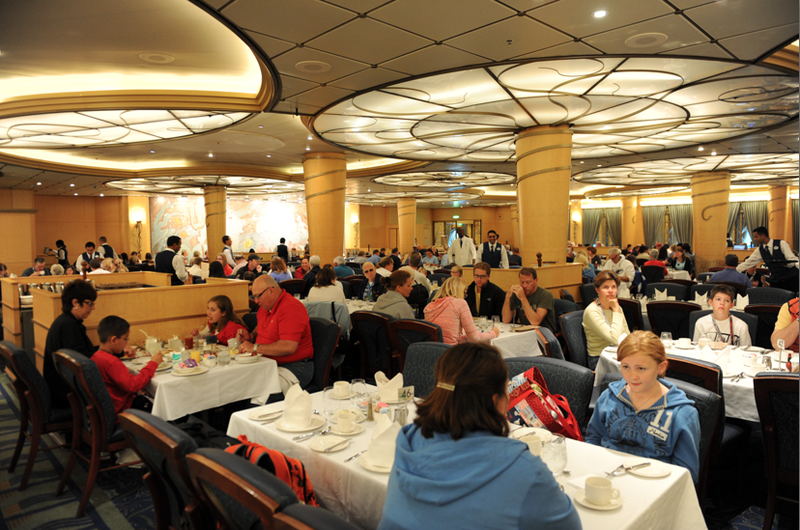 Dinner at Triton's restaurant, one of our onboard favorites. One of the most interesting things about our cruise is that it not only skews younger than most but it features many multi-generational families. Anywhere you go you hear kids shout “grandpa” or “grandma”, making us wish we had forced our parents to come. 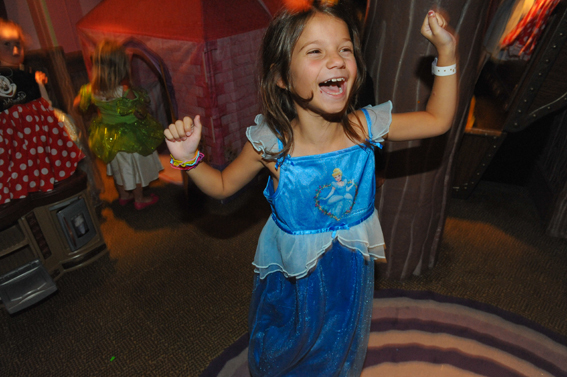 The broad range of ages is not lost on Disney to the degree that there are so many activities, shows, educational programs, movies and more that the options for anybody of any age are frankly overwhelming. 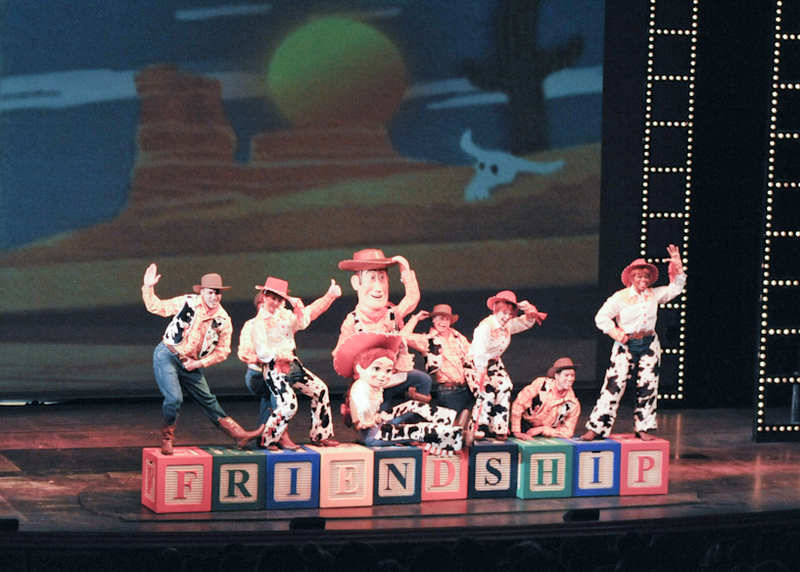 During this cruise our kids will be able to participate in a live Mickey Mouse trivia game show, a ship-wide scavenger hunt, pizza making, pajama parties, visits with Disney characters, Toy Story face painting, educational sessions with park rangers, movie watching, video gaming, dodge ball, basketball, pool party, story telling and, of course, 24/7 access to ice cream, soft drinks and pizza. The beauty of it all is that there is terrific supervision for my kids no matter where they are or what they do. My son says he’s enjoying his “freedom” from us at his tween club The Edge, Elena adores her camp counselor at The Oceaneer’s Club and Briani is still cranky but getting used to her hangout, Flounder’s Reef. The adult part of the activities schedule is similarly packed with trivia game shows, comedy acts, karaoke nights, Latin dance lessons, cooking demonstrations, club dancing, jazz concerts, spa time as well as wine, cheese, beer and even mojito tastings. Passenger reviews we read before boarding the ship say that compared to almost any other cruise with adults its refreshing to see that there’s less congestion of adults at all of the adult activities, probably because many passengers are using their cruise to build family memories. The highlight of our day was taking the kids to see The Golden Mickeys musical in the ship’s gorgeous, 2,000-seat Walt Disney Theatre. 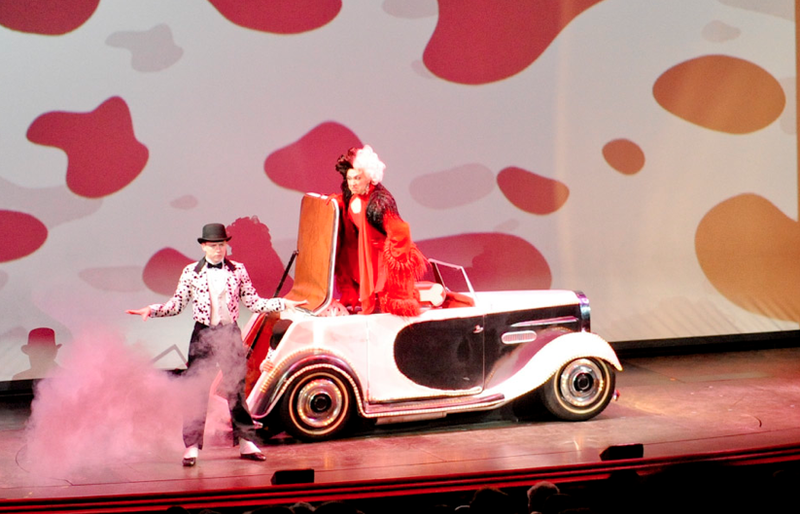 The approximate 50-minute, musical is a Broadway-style show that imitates the Oscars and features an awards ceremony in which characters from Disney movies are nominated in a series of categories. 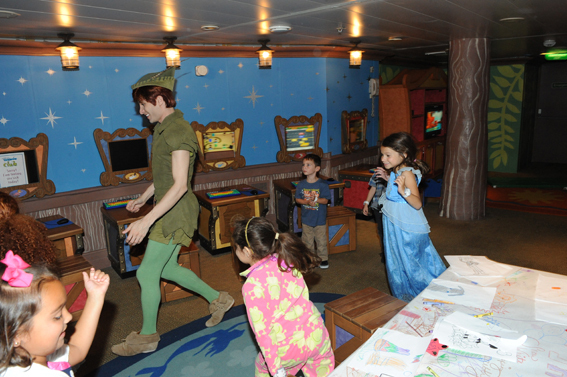 Peter Pan lead the hijinks of today's pajama party. We were warned that this cruise would be packed with Disney characters throughout the ship and it’s true. Even though it’s only been Day Two of our cruise we’ve already we’ve seen Mickey, Minnie, Pluto, three Disney princesses and Goofy. Get the family photo packages. The photos are taken from the proper angles and they are almost always top notch. The number of Disney characters we will encounter is only going to increase during the next few days so this puts me, a professional photographer by training, in a bind of either trying to be everywhere when those characters show up for photos or to buy one of the package photo deals Disney offers onboard. It’s a no brainer: we’ll get one of the family photo package deals that will give us 20 different shots to choose from.